Now, how many of you go through that when you look into the mirror? Usually we are thinking about what changes to make to hide whatever we don’t want people to see. That is what mirrors are for, are they not? It’s the function of mirrors in kali yuga. People sit in front of the mirror for so long time, usually trying to make adjustments, so to hide things they don’t want people you to see. That is what cosmetic industry is about, that by somehow or the other artificially enhance it. But Krsna sees his reflection and he goes into intoxication, madness by his own beauty. And then he is thinking, “What is it that Srimati Radharani feels when she sees my beauty?” When Srimati Radharani sees a Tamal tree, just the resemblance of the bark of the tree to my complexion, she goes completely mad and embraces the tree. When a slight breeze carries the scent of my body before Sri Radharani, she becomes so mad and intoxicated, she just wants to fly and merge into the breeze. Her ecstasies are something that Krsna admits that even he cannot comprehend. He is the Supreme object of Love. 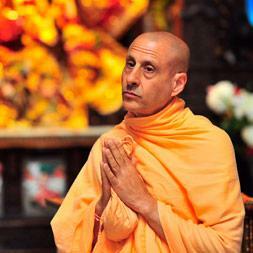 He is the vishaya vigraha of prem. He is the object of ecstatic love. Srimati Radharani is the ashraya vigraha of prem. That means she is the abode of love, she is the lover. And what the ashraya experiences even the vishaya vigraha cannot comprehend. Therefore, desiring the glory of Radharani’s love, the wonderful qualities in him that she alone relishes through her love, and the happiness she feels when she realizes the sweetness of his love, the Supreme Lord Hari, richly endowed with her emotions, appeared from the womb of Srimati Sachidevi, as moon appeared from the ocean. The loving affairs of Sri Radha and Krsna are transcendental manifestation of the Lord’s internal pleasure giving potency. Although Radha and Krsna are one in their identity, they separated themselves eternally. Now these two transcendental identities have again united in the form of Sri Krsna Caitanya. I bow down to him who has manifested himself with the sentiment and complexion of Srimati Radharani, although he is Krsna himself. May the Supreme Lord, who is known as son of Sachidevi be transcendentally situated in the innermost chamber of your heart, displaying with the radiance of the molten Gold . He has appeared in the age of Kali, by his causeless mercy to bestow what no incarnation has offered before, the most sublime and radiant mellow of devotional service, the mellow of conjugal love. This is the inconceivable internal reasons why Sri Caitanya Mahaprabhu appears. So Krsna from Goloka, in the mood of Sri Radhika appear at the exact same time as the scheduled Yuga Avataar, and the Yuga Avataar merges within him, to simultaneously bestow the highest fortune upon all of us. Lord Caitanya Mahaprabhu is giving this highest treasure. How? Through service to Vaisnavas and through showing compassion to the fallen souls, and by humility and tolerance taking shelter of his own self, which has come in his name. 12 Responses to "Internal reasons for Lord Chaitanya’s appearance"
Srimati Radharani’s love for Krsna is unparalleled that even Krsna cannot fathom it. 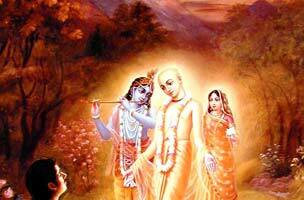 So to understand the mood of Srimati Radharani, he comes as Sri Chaitanya Mahaprabhu to taste her emotional ecstasy. In the process, he is so munificent that he distributes pure love of God to on and all. We are so fortunate to have the association of the acharyas (through their vani) in the lineage of Chaitanya Mahaprabhu and we should make use of this wonderful opportunity by sincerely chanting the holy names of the Lord and perfect our lives. Lord Chaitanya gave us highest treasure of chanting of the holy name.Very a beautiful nectar. The beauty of Lord Krsna is incomprehensible to our minds but it surely attracts our hearts. That is wonderful and amazing. Lord Krishna appears just to experience feeling of Srimati Radharani. 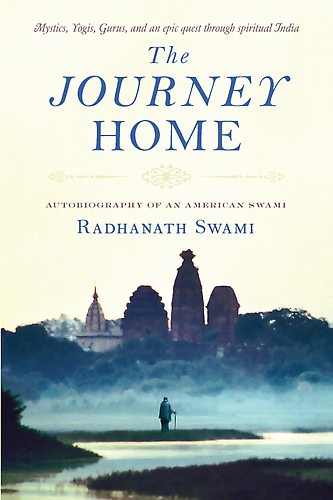 Radhanath Swami teaches that Lord Caitanya is Krishna himself in the mood of Radharani. He is here to bestow his blessings to deliver all souls in this world just by taking the holy name and serving the devotees.